Chronic diseases are illnesses that you can’t catch and that last a long time, do not get better suddenly, and are rarely cured completely. Examples of chronic diseases include heart disease, cancer, stroke, diabetes, and arthritis. Although chronic diseases are more common among older adults, they affect people of all ages. 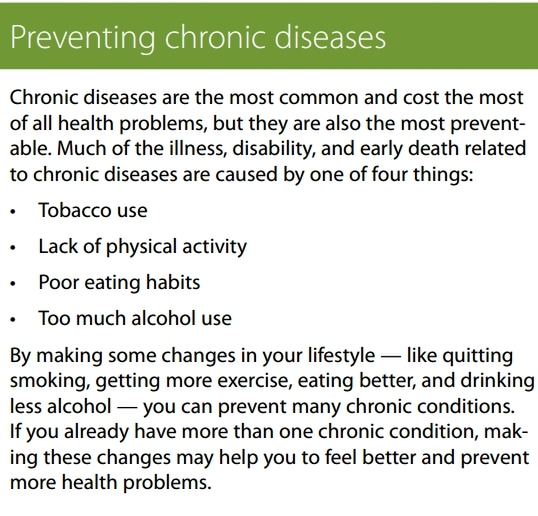 Many chronic diseases share the same risk factors. For example, smoking can contribute to heart disease, diabetes, and stroke. If you can get rid of a risk factor — by quitting smoking, for example — then you can generally lower your chances of developing many chronic diseases. Having more than one chronic disease at a time is called having “multiple chronic conditions,” or MCC. If you have MCC, you may be stressed just keeping up with your doctor visits. You likely need to see different specialists for your many issues. You may get confused by the different instructions and medications you get from each doctor. Also, it can cost a lot of money to have MCC, because you may need to take several prescription medications. Costs can add up quickly. • Take notes when you visit each doctor, so you remember important instructions. • Ask your doctor’s office to send a letter after each visit to your other doctor(s), so everyone is up to date on your health care. • Use an organizer to sort your medication so you take the right medicines each day.